Gusev began his sports career in 2009 as a player for the Central Sports Club of the Army (CSKA)-Red Army junior team in Russia. Gusev scored 17 goals in 48 games and eventually became the team’s leading scorer. The next year, Gusev made his debut in the Kontinental Hockey League (KHL), skating in 18 games for CSKA-Red Army. Gusev went on to win the Russian Minor Hockey League (MHL) Championship with CSKA-Red Army. Gusev’s career success was noted by Central Scouting, who ranked Gusev 52nd in their final rankings. Gusev did not, however, manage to be selected in 2011 NHL Draft. In the 2011-2012 season, Gusev played in 15 games for CSKA-Red Army in the KHL. 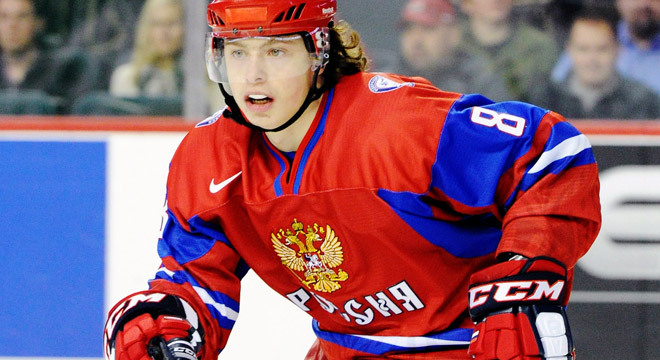 As a member of Russia’s national team, he competed at the 2012 Under-20 World Junior Championship, where he scored 3 goals with 6 assists; his efforts helped his team capture the silver medal. After this Under-20 Championship, Central Scouting ranked Gusev 20th amongst European skaters, and he was finally picked by Tampa Bay Lightning in the 2012 NHL Draft. “I never blame goalies. It is the fault of every squad member, when we lose a game." Gusev participated in three MHL All-Stars games in Russia, in three consecutive years: 2010, 2011 and 2012. He won the Kharlamov Cup in 2011, and he was recognized as the best sniper and the best bombardier of the Cup. Among Gusev’s numerous trophies is the Vitaly Davydov Prize (2011). He also won one of the MVP titles from the MHL playoffs. Nikita’s nickname is Guus Hiddink, because of his surname - Gusev. He is very proud to be nicknamed after the famous Dutch soccer manager. Hiddink himself managed the Russian national team from 2006 to 2010, and now he is a manager for the Russian Football Club Anzhi Makhachkala.